Show Notes lovely as a tree. Spirit of the Show Notes. Buy 1 Show Note, Get 1 Free. Sorry for the crappy formatting. Less than a month until the mmmmeetup! Jack will send out an e-mail regarding this. No, really? He says he really will. Have you sent in your ear buddies content yet? NHL Playoff time! Join our playoff movie pool. Apologies to those who don’t care about hockey. Congrats to Lo Pan the hockey pool winner. Jack met Joe Haldeman on the weekend. He’s now a happy camper. The Deadline is Wednesday to choose your team! If you have a team, then make sure you have 2 movies. I’ll do that chart soon. 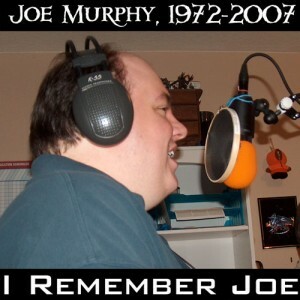 Featuring Krazy Joe Fiore – – Slice of Sci-Fi alum, and co-host of Megapodzilla. Raise a root beer today for Our Missing Ninja – – and brilliant friend, Joe Murphy. Of all the souls I have encountered in my travels, his was the most human.